FIT - The most flex of any MORR frame. Stretches to fit wide adult face. Lens ARMORR. Scratch Protection formulated for MORR eyewear. Scratch ARMORR (SA) is a permanent treatment that makes the surface of the lens 3 times harder than standard coatings without affecting optical clarity. Also eliminates "rainbow" lines you may have seen on other glasses you've used. Lens Design. Quarter-frame offers completely unobstructed peripheral vision in every direction. Great for minimizing your reaction time. Nose Pads. Vented hydrophilic rubber, hypoallergenic and replaceable. 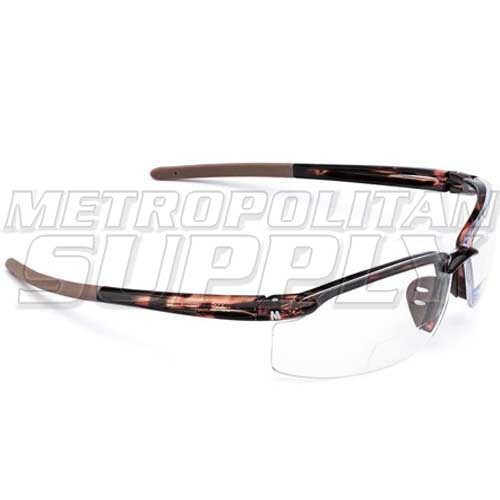 Soft non-slip nose pads and temple tips keep the glasses where they belong without uncomfortable pinching or pressure. Grip improves as you sweat. Bendable Temple Tips. FRREUD Z5 is the only model with temple tips that can be customized by bending into a shape that's most comfortable. Bend to hook around your ears or to tighten the grip. What makes MORR eyewear "smarrt?" Protection, Performance, and Price . MORR delivers incredible technology AND they made it affordable. When you finally get tired of losing or breaking expensive sunglasses, these should be your next pair. They're designed to get into harm's way without hurting your wallet.